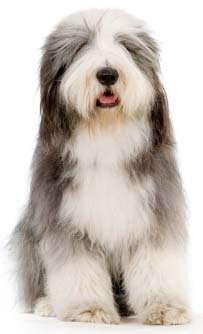 Learn about the temperament and personality of the Bearded Collie. Discover what he's like to live with, his traits and characteristics and how he generally behaves. And look at lots of Bearded Collie photos. The Bearded Collie is an active, outgoing, intelligent, affectionate, and sometimes boisterous dog who makes a great family pet for an active family. The Bearded Collie needs exercise, both physical and mental. Beardies are playful and like to jog, swim, wrestle, play Frisbee, and go for brisk walks. They are always ready for action and are happy to join their family in any activity. With what seems like boundless energy, they also enjoy agility, herding, obedience, and tracking. They love to work in partnership with their masters and are very responsive to you. They also make good therapy dogs because they love people. They see everyone as either a friend or a potential friend. They need to be with their loved ones and can become destructive if left alone for hours at a time. They will bark when lonely or bored. Barking is an important part of this breed's working style, but it can be a problem for some people, especially those with close neighbors. Beardies are usually not "yappy" problem barkers, but they do bark when excited and they announce all visitors with joy. And once those visitors cross the threshold, Beardies will greet them by jumping on them, unless you train them not to. But with all the training in the world, Beardies are still jumpers. Beardie owners affectionately call them "bouncy." They can easily jump a four-foot fence. (They can also dig under them.) When you get home from work, they will probably greet you by jumping up and kissing your nose. Beardies can be a touch stubborn and need obedience training. They are independent thinkers, but are also anxious to please you. They will do just about anything for your approval, but sometimes they add their own special twist. They may not obey commands if they don't see the point, and they are rather famous for keeping their owners humble. They've been known to open cupboards and steal food, counter surf, and eat television remotes. They can have quite a sense of humor. They usually get along well with children and other animals, especially when raised around them. However, Beardies will often try to herd their family members and some will nip at the ankles of young children. Within the breed, temperaments range from laid back to rowdy, but they can all be a bit silly. They are sensitive, responsive, adaptable, gentle, and devoted. And they can sweep your coffee table clean with a single wag. The Bearded Collie sheds a fair amount of hair. You'll find hair stuck to your couch, carpets, clothes and everything else in your home.